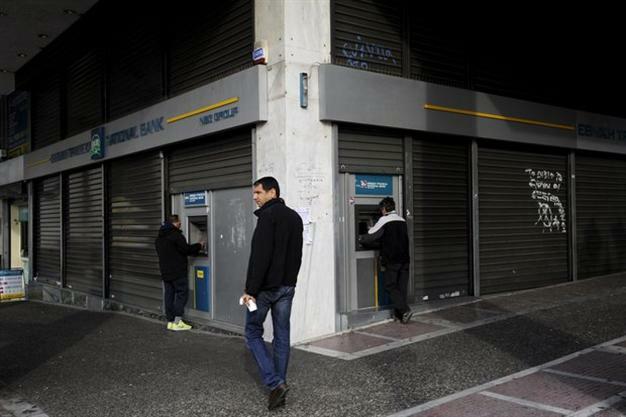 Four major Greek banks must find up to 14.4 billion euros ($15.8 billion) to survive potential economic shocks, the European Central Bank said on Oct. 31, releasing the results of an in-depth financial health check. Weakened after years of recession, Greece’s banks took a further battering this year when the government pushed the country to the brink of a euro exit in a standoff with Berlin and Brussels over the terms of Greece’s international bailout. While less than anticipated under the new aid package — Greece’s third since 2010 — the big four banks now have until Friday to explain how they will plug the capital hole on their balance sheets. The health check comprises an asset quality review and a forward-looking stress test aimed at assessing “the specific recapitalization needs of the individual banks” under Greece’s current economic adjustment program. “Overall, the stress test identified a capital shortfall across the four participating banks of 4.4 billion euros, under the baseline scenario, and 14.4 billion euros under the adverse scenario,” the ECB said. That is less than the 25 billion euros earmarked for the recapitalization of the four major banks in the 86 billion euro bailout package agreed between Greece and its creditors this summer. Piraeus was the weakest, with an anticipated shortfall of nearly five billion euros in an adverse scenario. The banks have until November 6 to submit plans showing how they plan to cover their shortfalls, as part of a recapitalization process to be completed before the end of the year. Raising fresh capital would “result in the creation of prudential buffers at the four Greek banks, which will improve the resilience of their balance sheets and their capacity to withstand (a) potential adverse macroeconomic shock,” the ECB added. The National Bank of Greece, meanwhile, reported a net loss of 1.614 billion euros for the second quarter, with provisions for bad loans in Greece soaring to 2.3 billion euros from 323 million in the first quarter.